The outbreak of anti-immigrant violence in May 2008 in the Johannesburg township of Alexandra have in the mainstream media been presented as an instance of xenophobia, this chapter argues that what is termed xenophobia is in fact racism: black-on-black-racism/intra-black racism practised by people of the same population group, which has characterised postapartheid South African black social relations. These are characteristics of decolonisation and difficulties of assimilating and integrating black African immigrants into the new South Africa. On the other hand, there is increased cultural contact and intermixing as a result of accelerated presence of other identities. 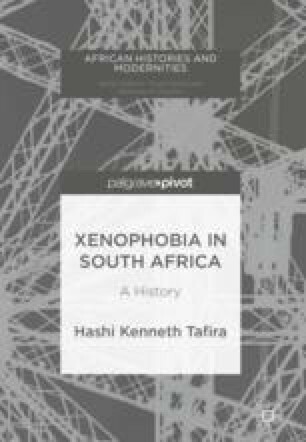 There are, of course, conceptual and definitional limitations of the term xenophobia in describing the complex social realities happening in present-day South African black communities. Rather, the call is for the deconstruction of the term xenophobia and that we begin to see it as culturally based racism.